And this raises another fascinating question. 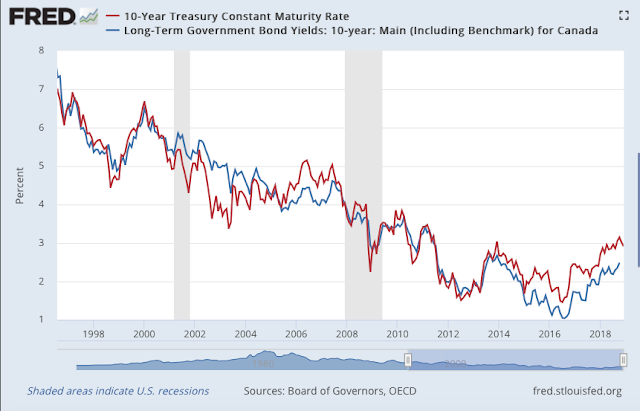 If quantitative easing does not lead to inflation, or lower interest rates (however theoretically or ideologically incorrect) does QE offer an escape hatch from the ever-rising public debts faced in Japan and the US? Should the US Federal Reserve buy a few trillion dollars in treasuries during any recession and then just hold onto the hoard? You get Mobius strip economics. The public owes money to the public. Interesting consideration. Unfortunately, I doubt QE solves much of anything. QE (the low interest rates, all of the Feds efforts to introduce cheap money into the economy) inspired consumption and not much more. Reckless consumption inflated a bubble, inflated profits and low interest rates kept consumer confidence high and provided no impetus to save. None of which are good for long term growth and none of which offer a potential solution to our debt problems. I suspect the real pain awaits us (stagflation). 3. guess the Fed buys 20% of all available apartments in (say) Chicago, or the BCE does the same in Paris (at the same time, promising to "possibly buy even more") with newly created money: still would you think the average market prices of the apartments in those cities would remain unaffected? 4. and further to this: why then disrupt a well functioning "free market" mechanism as the US bond market, if there is no change in market prices? what was the goal then of the greatest monetary stimulus in history, a 4 trillion stimulus with new money? Canadian government bonds can be purchased with US dollars can they not. Alternative possibility, the increase in the price of US bonds caused the non US investment community to buy Canadian bonds. In Canada a lot of mortgages are guaranteed by CMHC which is a government agency. As I understand what happened, when liquidity for the banks dried up large mortgage portfolios were transferred from the banks to the government balance sheet. So mortgages went to the Canadian government rather than the central bank through QE. Correct. The Canadian gov't conducted a sort of "backdoor" QE by raising the cap significantly on the CMHC (Cdn equivalent of Fannie/Freddie). They then allowed for 40 year amorts with zero down. Essentially blowing a housing bubble to replace lost manufacturing/services output in the financial crisis. The narrative that Canada "managed" the crisis response more effectively than other G7 nations typically omits these crucial data. We now have the highest consumer debt/GDP levels and an affordability crisis in our major cities. Short term gain, long term pain. Anonymous I had in mind the "Insured Mortgage Purchase Program" underwhich $70 Billion in mortgages were transferred from the banks to the government. This it seems to me is functionally equivalent to QE even though it involved the government buying directly from the banks rather than the Fed buying MBS (as in the United States). High house prices in Vancouver and Toronto are driven in part by geography and zoning restriction. Prices in other areas of Canada went up but not like Vancouver and Toronto. 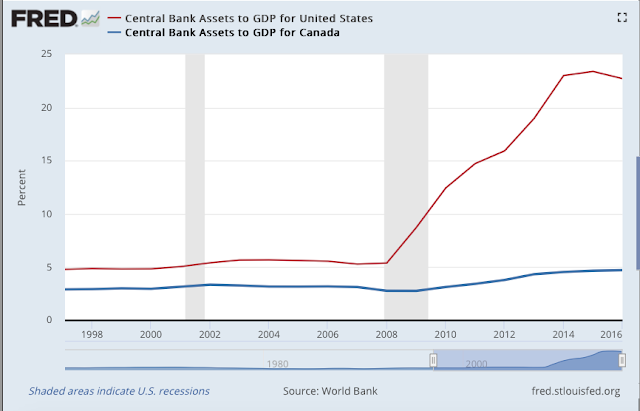 Did the Canadians also introduce interest on reserves? In that case it wouldn't be particularly surprising that the net effect was basically nothing.